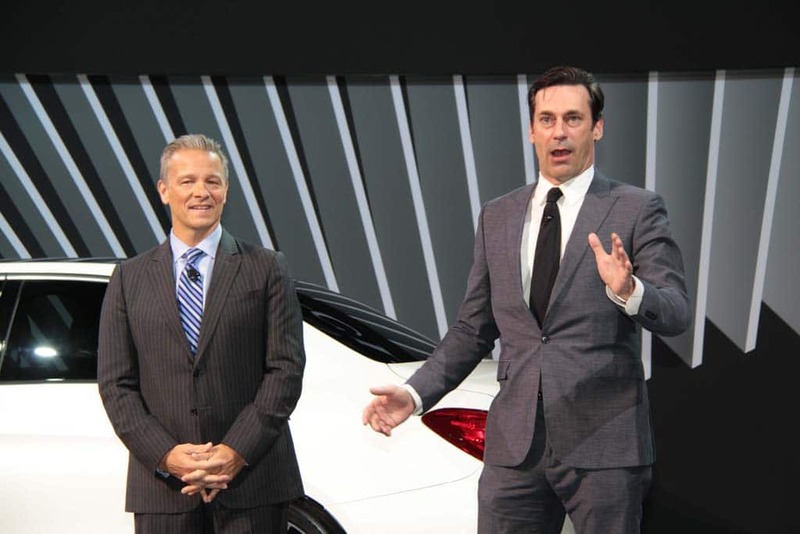 Actor Jon Hamm helps unveil new luxury coupe at NY Auto Show. Actor Jon Hamm and Mercedes-Benz USA President Steve Cannon unveil the new S63 AMG Coupe. Too bad for Don Draper that he’d be long retired by now. Had he stuck around, the fictional advertising executive in the popular TV series Mad Men would have been ponying up his paycheck to purchase one of the new Mercedes-Benz S63 AMG Coupes that is making its debut at the New York International Auto Show. Or so says Jon Hamm, the actor who portrays the handsome and worldly Draper – but who also provides voiceovers for the German maker. Initially hidden behind the scenes during Mercedes’ auto show news conference, Hamm came out on stage to help unveil the new luxury coupe with Mercedes-Benz USA President Steve Cannon. It would probably take someone in his position as co-owner of a Madison Avenue ad agency. While Mercedes has yet to reveal the price of the C63 AMG 4Matic Coupe, the model it replaces started at $154,600 – plus delivery charges. Cannon and Hamm at the Mercedes reveal. 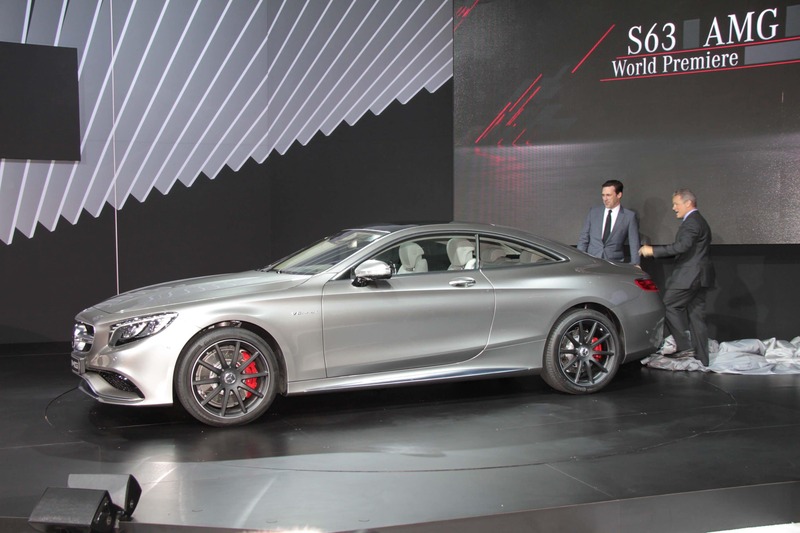 The S63 Coupe is the “ultimate halo car” for the Mercedes-Benz brand, proclaimed Tobias Moers, the head of the AMG subsidiary that produces the German maker’s highest-performing models, as he joined Hamm on stage. The big coupe, a spin-off of the Mercedes flagship S-Class sedan, is powered by a 577 horsepower 5.5-liter biturbo V-8. That’s 31 hp more than the outgoing coupe – and, Moers noted, 97 more than the Mercedes C-Class DTM race car. Torque is rated at a neck-snapping 664 pound-feet, or 31 more than the current Chevrolet NASCAR entry, added Moers. That’s enough to propel the C63 AMG Coupe from 0 to 60 in 3.9 seconds – on the way to a top speed of just under 200 mph. Meanwhile, a specially-tuned all-wheel-drive system – Mercedes’ 4Matic – splits torque by delivering 33% of the engine’s torque up front, and 67% to the rear wheels. The new model also gets a variety of high-tech safety and creature comfort features. There’s infrared night vision, for example, and its forward-facing radar can bring it to a complete stop if traffic slows, or if a pedestrian walks in front while it’s cruising city streets. Critical vehicle performance information, as well as navigation turn-by-turn instructions pop up on a fighter jet-like heads-up display. And a new touchpad allows a motorist to scribble in an address rather than typing it on the big touchscreen. The U.S. has long been the world’s biggest market for AMG products, and that means that even if a real-life Don Draper were to want an S63 Coupe they might have to wait. “We have already ramped up production as far as we can go,” lamented AMG chief Moers, though AMG has found ways to break through the bottlenecks before to meet its growing demand. Then again, considering his connections to the company, one might suspect that John Hamm just might jump to the head of the line should he decide to place his own order. This entry was posted on Wednesday, April 16th, 2014 at and is filed under Automobiles. You can follow any responses to this entry through the RSS 2.0 feed. Both comments and pings are currently closed.